From late Middle English, borrowed from Middle French millet; from Latin milium, ultimately from Proto-Indo-European *melh₂- (“to grind, crush”), see also Ancient Greek μελίνη (melínē, “millet”) and Lithuanian málnos (“millet”). Any of a group of various types of grass or its grains used as food, widely cultivated in the developing world. 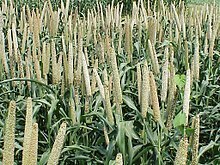 From Turkish millet, from Ottoman Turkish ملت‎ (millet), from Persian ملت‎ (mellat), from Arabic مِلَّة‎ (milla). (historical) A semi-autonomous confessional community under the Ottoman Empire, especially a non-Muslim one. […] in support for a common Serbian Orthodox Church, the one traditional institution permitted to exist under the Ottoman millet system which sought to rule subject peoples indirectly through their own religious hierarchies. Christians and Jews as People of the Book […] were organized into separate communities, or millets, defined by their common practice of the same religion, which was guaranteed as protected as long as it was primarily practised in private. From mil +‎ -et; a diminutive of mil, from Latin milium, ultimately from Proto-Indo-European *melh₂- (“to grind, crush”). “millet” in le Trésor de la langue française informatisé (The Digitized Treasury of the French Language). 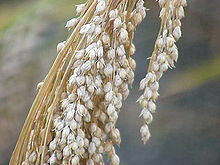 From Ottoman Turkish ملت‎ (millet). This page was last edited on 14 March 2019, at 14:32.